Sustainability: Efficient small micro-CHP generators are coming ! As it turns out, most homes already have half of a miniaturized power plant. Electricity is just a part of our daily energy consumption - we also need heat to keep us warm. We need thermal energy to heat our homes, hot water and food. And so, in the US, more than 60 million homes are heated by natural gas and there are 100 million gas boilers installed in European homes. Micro-CHP can attain overall efficiencies of 90% by generating both electricity and heat on demand and at the location where both are needed and valuable. This contrasts with central power plants, which produce electricity at 35% efficiency. At these plants, the waste heat is usually thrown away, since the heat can’t be transported hundreds of miles to where it is needed. 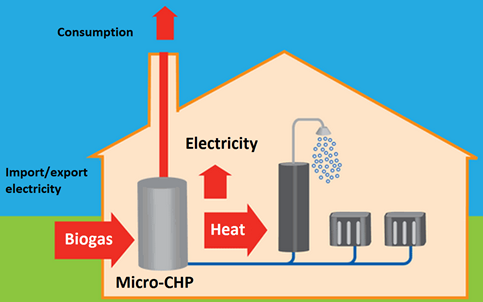 The higher efficiency of micro-CHP can help cut homeowners' energy bills by 30% and reduces their carbon footprint. The benefits of a system of solar, batteries and efficient small generators go beyond being greener and saving energy bills. One recent sad example remains unresolved. A month after Hurricane Maria hit Puerto Rico, a US territory with 3.4 million people, 80% of the island still has no electricity. This tragedy shows the fragility of traditional centralized power generation and transmission. Being able to go small matters. Together, these technologies enable distributed generation, even at the level of individual homes. This can be critical for the developing world, where billions of people still don’t have access to reliable power. With these technologies, society can leapfrog the need to spend trillions of dollars on infrastructure for central power generation and transmission. This can help us to deliver power to all people faster. The largest deployment of micro-CHP is in Japan in 2009 where over 90,000 units in place, with the vast majority being of Honda's "ECO-WILL" type. Six Japanese energy companies launched the 300 W–1 kW PEMFC/SOFC ENE FARM product in 2009, with 3,000 installed units in 2008, a production target of 150,000 units for 2009–2010 and a target of 2,500,000 units in 2030. 20,000 units where sold in 2012 overall within the Ene Farm project making an estimated total of 50,000 PEMFC and up to 5,000 SOFC installations. For 2013 a state subsidy for 50,000 units is in place. The ENE FARM project will pass 100.000 systems in 2014, 34.213 PEMFC and 2.224 SOFC were installed in the period 2012-2014, 30,000 units on LNG and 6,000 on LPG. The European public–private partnership Fuel Cells and Hydrogen Joint Undertaking Seventh Framework Programme project ene.field aims to deploy by 2017 up 1,000 residential fuel cell Combined Heat and Power (micro-CHP) installations in 12 EU member states. The programme brings together 9 mature European micro FC-CHP manufacturers into a common analysis framework to deliver trials across all of the available fuel cell CHP technologies. Fuel cell micro-CHP trials will be installed and actively monitored in dwellings across the range of European domestic heating markets, dwelling types and climatic zones, which will lead to an invaluable dataset on domestic energy consumption and micro-CHP applicability across Europe. The ene.field project also brings together over 30 utilities, housing providers and municipalities to bring the products to market and explore different business models for micro-CHP deployment.